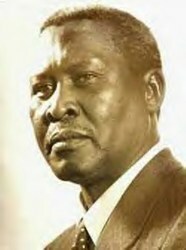 Today the church remembers Albert John Luthuli, Prophetic Witness in South Africa, 1967. Eternal God, we thank you for the witness of Chief Luthuli, Nobel Laureate for Peace, who was sustained by his Christian faith as he led the struggle against apartheid in South Africa. Strengthen us, after his example, to make no peace with oppression and to witness boldly for our Deliverer, Jesus Christ; who with you and the Holy Spirit lives and reigns, one God, for ever and ever. Amen.